It’s not so much a work/life balance, it’s more of a reality/fantasy balance instead. Often real life takes over and my writing ends up taking a back seat. On odd occasion it’s hard to leave the real world behind for a while to get on with the script in hand. The week covering the end of October and the start of November is my son’s favourite time of the year. Halloween because he enjoys dressing up and going to his grandparent’s house for a small party alongside his little cousin. After much debate he settled on going this year as a Ninja Turtle (last year it was Batman). A few days after that saw his eighth birthday. His actual birthday was on the Monday but he was devastated that he would be at school on that day so we moved the bulk of his celebrations to the Sunday before. After going out for a pizza lunch we arrived home and gave him his present. 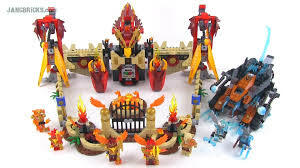 My son is currently obsessed with Lego, more specifically Lego Chima in which small tribes of animals build massive tanks and warplanes to fight each other over the power source known as Chi. It’s a little bit like Animals Of Farthing Wood only with more explosions. He saves his money and buys smaller Lego sets when we go shopping each Sunday. Whilst he always looks at the larger sets he soon comes to the conclusion that there would be no way he could save the amount of money needed to buy them. The cash just burns a hole in his pocket and he goes and spends it. Therefore we ended up buying him the Flying Phoenix Fire Temple. This thing is huge, full of mechanisms and took me seven and a half hours to build with him on the day. My only frustration is knowing that it will inevitably be ‘customised’ or demolished within a month. It’s an impressive piece of engineering though, starting as a temple building and becoming a flying bomber at the flick of a switch. This thing was the bane of my entire afternoon. A couple of days after that was Bonfire Night which once again takes place at my parent’s house. Nothing large scale, just my Dad attempting not to set himself alight whilst letting off the small box of fireworks he bought from Sainsbury. Being scared of loud noises in my youth I used to watch this spectacle from my bedroom window at the back of the house. Oddly my niece did the same thing this year. There were also hot dogs, a fun time was had by all. This is actually a long way around for saying not much in the way of writing has been done lately. Evenings have mostly seen me knackered and Order For Burning currently sits in that awkward middle section just before we hit the downturn towards our final scenes. This is the ‘swimming through treacle’ bit which isn’t a great encouragement to get along with it. Also difficult is the fact that what I have written thus far is rotten to the core. But you knew that bit already.